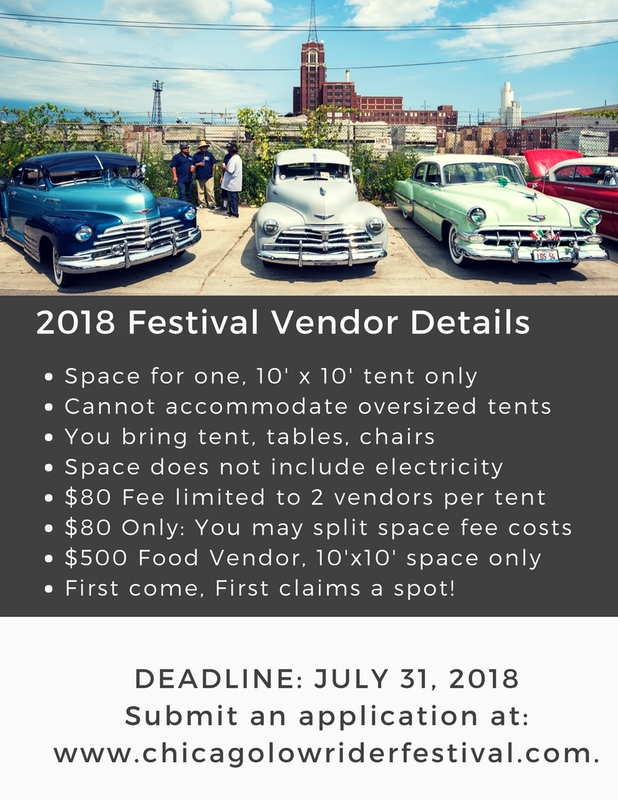 Submit our vendor interest form by filling out the 2018 Application! Interested? Seeking artists, makers, handmade, designers, vintage and oddities, food and non-alcoholic beverage purveyors and other cool folks interested in being a part of our pop-up El Mercado this year! Last year we welcomed over 5,000 Lowrider and vintage car enthusiasts. This year is guaranteed to be even better! Below is our Participation Agreement, please read carefully before agreeing to our terms and conditions regarding your participation in the Festival. If selected, you will be asked to submit your electronic signature at the bottom of the agreement. THIS AGREEMENT, dated March 1, 2018 is between Chicago Urban Art Society (CUAS) and the signatory at the end of this agreement (“Participant”). 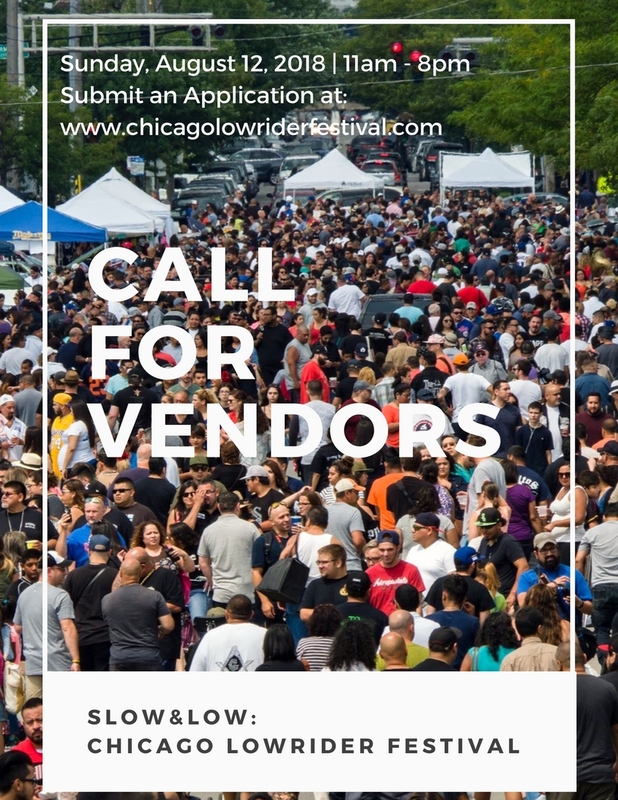 Participant will be participating in the Slow&Low: Chicago Lowrider Festival on the date selected above (the “Event). This Agreement must be signed by Participant and submitted to CUAS at least 2 weeks prior to the first Event in which the Participant will act with the highest regard for the safety of the attendees and other participants of the Event, and will adhere to all laws, policies, rules and regulations applicable to the goods and/or activities of Participant, including obtaining all licenses, permits, and approvals that may be required to enable Participant to conduct its activities at the Event and fulfill its obligations under this Agreement. Liability: CUAS will not be responsible for any loss or damage to Participant’s property, injury to, or death of the Participant (or its agents, employees, and/or personnel), or Participant sales. Participant expressly assumes all risks of loss, damage, liability, injury, or destruction resulting from a cause whatsoever, including but not limited to acts or omissions by Participant, and hereby releases and waives any claims against CUAS related to such loss, damage, liability, injury, and/or destruction. Insurance: Participant covenants to be fully responsible for any of its liabilities, actions, or omissions, and will indemnify, defend, and hold CUAS (and its officers, employees, agents, vendors, affiliates, and representatives) harmless against any claims related to Participant’s liabilities, actions, or omissions. Cancellations: The event will proceed regardless of weather. If there is a cancellation: (a) By CUAS: If cancellation of the Event by CUAS is necessary due to unforeseen circumstances, acts of a third party, or other circumstances which (in CUAS’s sole judgement) may compromise the safety of Event participants, then the Event will not be rescheduled and there will be no refunds to Participant. (b) By Participant: If Participant cancels its participation at least one month prior to the Event, then CUAS will offer a full refund, less a $10 jurying fee. If Participant cancels its participation between four and two weeks prior to the Event, then CUAS will offer a 50% refund. If Participant cancels its participation in the Event within two weeks prior to the Event, then CUAS cannot offer a refund, due to the administrative work already done at that time. Once Participant cancels, it forfeits its spot in the Event. Participant may not assign this Agreement to any third party, or delegate any of its obligations without the written consent of CUAS. Only the accepted Participants are able to sell or distribute their items and/or conduct activities at the Event. The vendor list, map, and Booth locations are subject to change without notice. CUAS does not guarantee any level of attendance at the Event and there will be no refunds, under any circumstances, after the Event is over. Change in terms: The terms of the Agreement may be changed by CUAS and notice of such change(s) will be sent to you in writing. You agree to accept notices via email, sent to the address indicated. CUAS reserves the right to decline, prohibit, or expel any Participant exhibit, or prevent any activity, displays, product, or conduct, which (in CUAS’s sole judgment) is out of keeping with the character of the Event or endangers the venue, any attendee, or other participants. Participant and its agents, employees, personnel, and/or independent contractors who participate in the Event agree to be bound to this Agreement. The terms of this Agreement, including any waivers, inures to the benefit of CUAS and its affiliates and Event co-producers and sponsors. Independent Contractors: The relationship of Participant to CUAS is that of an independent contractor, and nothing contained in this Agreement will be construed as creating a partnership, joint venture, employment relationship, agency, or other relationship between the parties, or to make CUAS liable for the debts or obligations of Participant. The validity, interpretation, construction, and enforcement of this Agreement will be governed band controlled by laws of the State of Illinois, without regard to its rules with respect to choose of law. Any dispute arising out of related to this Agreement must be brought in federal or state court in Cook County and the parties hereby consent to the exclusive jurisdiction and the venue of such forum. This Agreement, and any rules and regulations provided to the Participant by CUAS or CUAS’s affiliates, will contain the entire Agreement and understanding between the parties hereto with respect to participation in the Event. If any term is contrary to the law, then that term will be served and the remainder of the Agreement will remain in force.